You may or may not be familiar with the term, and now hashtag, #FullLuhnow. The term derives from the strategy employed by Astros general manager Jeff Luhnow while rebuilding the Houston Astros from 2012 to the present. Fundamental to the strategy is losing purposefully. By that, I don’t mean that the Houston Astros walked home the winning run in the ninth inning of games or made poor in-game decisions on purpose. By that, I mean that the Astros purged all useful players from their major league roster in exchange for young players, understanding they’d lose in the present. In addition to acquiring young players, this positioned the Astros high in the amateur draft, where they could select elite prospects. The strategy, to-date, has worked. Correa is perhaps the most valuable asset in all of baseball, Mark Appel was recently traded for elite 25-year-old closer Ken Giles, while Bregman and Tucker rank 42/61 on the latest Baseball America top 100 prospects list. Some people have stated that the Astros plan only works if Carlos Correa is available. But that’s not really true. The Astros possessed three consecutive #1 picks. Only once in the past 30 years has there been a three year draft period without at least one of the #1 picks accumulating 20 W.A.R. : 2002-2004 which is probably an outlier given the Padres money-minded decision to select Matt Bush with that #1 pick in 2004. Since that Bush selection, #1 overall picks include Justin Upton, Stephen Strasburg, David Price, Gerrit Cole, Bryce Harper, and Carlos Correa. Basically, if you get three consecutive #1 picks, it’s hard to not get a Carlos Correa. But the fruits of amateur drafting from going #FullLuhnow extend past just that first selection in the draft anyway. All other picks are also at the top of their respective rounds, providing additional incremental value throughout the draft. The #11 prospect in baseball was selected by the Astros with the 1st pick in the 2nd round in 2014: A.J. Reed. The #74 prospect in baseball was selected by the Astros with the 1st pick in the supplemental 1st round in 2015: Daz Cameron. Prospect acquisitions didn’t start and stop at the amateur drafts, however. Because going #FullLuhnow implies being content with losing now, player value in the current season is rendered meaningless. Why have someone provide 2.5 W.A.R. at $3 million, a bargain of ~$10 million, for a team destined for last place? Going #FullLuhnow makes these value decisions very simple: trade present value for future value. Acquire $10 million in future value, in cheap team-controlled prospects, for that current $10 million in value. The Astros have done just that. Starting just before Luhnow even arrived, the Astros dealt Hunter Pence from their 100 loss roster in exchange for a bevy of prospects, including Jon Singleton and Domingo Santana. Santana was used this prior season to acquire Carlos Gomez and Mike Fiers at the trade deadline. One of Luhnow’s first moves was dealing Mark Melancon to the Red Sox for Jed Lowrie, who he then spun to the Athletics for Brad Peacock, Chris Carter, and Max Stassi. At the deadline in 2012, the Astros dealt J.A. Happ and Brandon Lyon to Toronto for a handful of prospects, including Joe Musgrove, a current top 100 prospect. In 2013, the Astros traded reliever Jose Veras to the Tigers for David Paulino, now a top 100 prospect. At the trade deadline in 2014, the Astros acquired Jake Marisnick and the current #20 prospect in baseball, Francis Martes, for Jarred Cosart. And before last year, the Astros dealt Dexter Fowler for Luis Valbuena and Dan Straily. There were certainly some misses along the way, but the high volume of deals produced a high certainty that the Astros would be acquiring future value to coincide with the window their elite draft picks would open. That window is now open, evidenced by both a) making the postseason in 2015 and b) Las Vegas currently projecting the Astros to make the playoffs again in 2016. And that’s with the Astros still holding on to a handful of top 100 prospects to accentuate their window or, like Domingo Santana last year, to acquire present players to help now. [Luhnow’s] bicultural background [will] be an asset in recruiting players from Latin America and developing the Hispanic market for Los Astros. Prior to joining the Astros, Luhnow had many roles with the St. Louis Cardinals including VP of Baseball Development, in which he created the Cardinals’ Dominican academy, and VP of Player Procurement, which included directing both international and amateur scouting. If you swapped ‘Cardinals’ with ‘Rangers’ and ‘Los Astros’ with ‘Los Padres’, you’d have an accurate description of A.J. Preller. The major problem, of course, is that the Padres “new” ownership group has appeared reluctant to commit to any coherent plan. From committing to signing their homegrown players to trading Chase Headley, Cameron Maybin, Nick Hundley and Jedd Gyorko, from espousing the need to draft and develop homegrown talent to trading first round selections Trea Turner, Joe Ross, Max Fried, and others in one offseason, and from adding a handful of top players in the 2015 offseason to jettisoning the two most successful of those acquisitions – Craig Kimbrel and Justin Upton – one year later, Padres ownership seems to be following a plan best described as belonging to a headless chicken. And while committing to going #FullLuhnow was probably wishful to begin with, it is officially dead with Peter Seidler’s most recent comments. It irritates the heck out of me when I hear people say we’re rebuilding. We’re building with no letters or anything before that. We’re building. Unfortunately, Seidler also informed Padres fans that he’s the one in charge in long term strategy. #FullLuhnow would have to start with him, but unfortunately it stops with him. Any hope Padres fans may have had for going #FullLuhnow is officially dead. RIP #FullLuhnow. Fans with a casual awareness of Change the Padres might find it strange that I’d advocate for #FullLuhnow. Isn’t trading away serviceable players against Change the Padres’s creed? Tell Padres fans you’re rebuilding. Own it. Explain that it increases the expected World Series wins for the Padres. Explain that value in doomed seasons is not value at all. Explain that we don’t possess elite prospects and that acquiring them through top draft picks is the path of least resistance to the World Series. Don’t sell false hope: the Padres didn’t lose because Bud Black wasn’t inspiring; the Padres didn’t lose because Jedd Gyorko and Justin Upton didn’t appear to care enough; and the Padres didn’t lose because Chase Headley couldn’t handle pressure. Tell it like it is: the Padres lost because they don’t have enough elite players and they have to find a way to acquire them; and the Padres aren’t going to win in 2016, so that’s why we’re acquiring future players. As a slogan, it could be simplified to “tell the truth and recycle the money”. Perhaps most frustratingly, going #FullLuhnow is not that hard. Compared to other strategies, like being the absolute best at scouting or development, #FullLuhnow is much easier to implement. Losing, by definition, should be easy. But watching a team so obviously destined to lose, but unwilling to take fundamental steps to maximize their overall World Series odds, is hard. Watching Tyson Ross and Andrew Cashner combine for 5+ W.A.R. in 2016 at a bargain rate, for a certain loser, is hard. Spending millions on Jon Jay, for a certain loser, instead of [random Cuban, Dominican, or Venezualan prospect] is hard. Being sold false hope that this team is going to compete, when it is a certain loser, is hard. 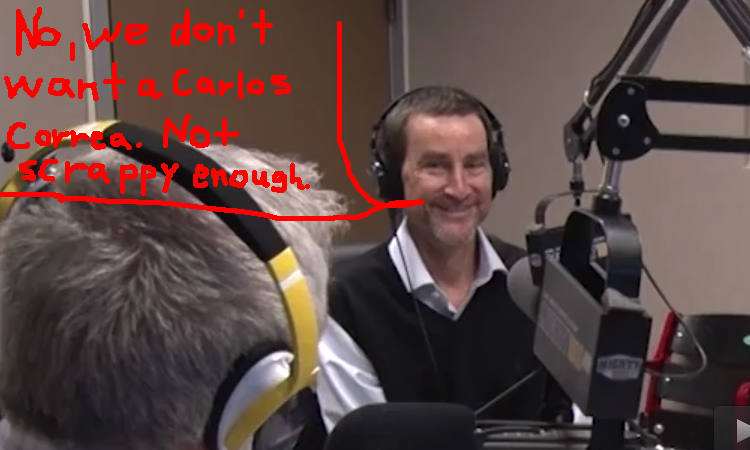 In the end, failing to consider going #FullLuhnow is a failure of leadership by principal owner Peter Seidler. Or should I say *Sigh*dler?